Okay, that's not exactly what Dr. Gio called it... but GC didn't post the video for it and I can't remember exactly what he called it. However, it was such a brilliant insight that I wanted to write about it anyway. 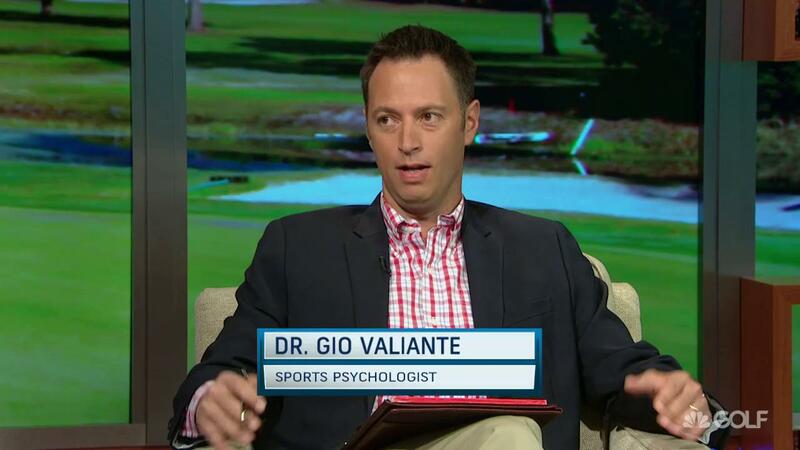 Dr. Gio did two segments on Morning Drive Monday morning. GC has only posted one of them. (I've reposted it below. The first 2:40 or so is a recap of the Diamond Resorts event, then he uses that to talk about "psychological fluctuation." Sounds weird, but it's useful stuff.) The one they didn't post included Charlie Rymer and talked about his first professional tournament in a decade or so, and what Dr. Gio said struck me as incredibly useful. He says your golf swing is made up of three parts -- the psychological, the physical and the mechanical. But here's the cool thing: Dr. Gio says you can use any of the three as "fixes" for a problem, regardless of which area is causing it! That's because a problem in any one of those areas affects the other two, so you can attack the problem from any area. Here's an example: Let's say your having confidence issues with your driver. You hit it fine on the range but can't keep it in the short grass during a round. If you feel anxiety when you stand over your driver, that's going to cause physical problems like raising your blood pressure, which changes the tension in your muscles or the blood flow in your hands (which affects your feel). It might also cause you to develop a mechanical problem because your flexibility is affected or you just get impatient and jerky. What are you gonna do to fix it? Well, you've probably hit some good drives before. So you could try visualizing those good drives -- the rhythm and how you felt when you hit them. You've hit good drives before, so there's no reason you can't do it again. Or you might attack the physical tension. You could focus on slowing your breathing or relaxing your forearms. Or you might do what a lot of pros do and create a go-to, can't-miss shot. You might learn to tee the ball lower and (if you're a rightie) swing left with an open clubface. That way you eliminate one side of the course and effectively double the width of the fairway. The first is a psychological fix. The second is a physical fix. The third is a mechanical fix. And any or all of them could be effective for you. In other words, you don't have to drive yourself nuts trying to identify exactly where the problem originates. You can simply identify the effect of the problem and adopt a fix that you're comfortable with. Isn't that cool? Here's the video of that first session with Dr. Gio I promised. You might also find some useful help in it. Remember: You don't have to agonize over the exact cause of your problem. All you have to do is find a way to correct its effect on your game, and that should help you beat it.